I began the study of metaphysics and spirituality in my early twenties, but I always have known, since the age of 7 that reincarnation is truth. In my early thirties I discovered I had carpel tunnel syndrome, although I had shooting pains going up my arms constantly I knew that surgery wasn’t for me. Not soon after I manifested this illness I learned about healing with crystals and healing touch, and I’ve never looked back. 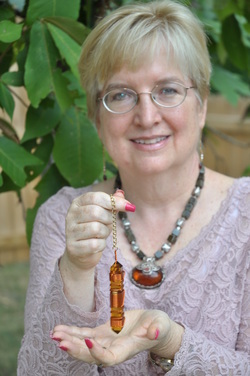 I now practice vibrational energy attunements where I utilize crystals, incense, tuning forks, healing touch, etheric weavers, glyphs, prayer and affirmations. This type of healing work can be done either in person or from a distance for remote healing. I also enjoy working with people’s guides and angels. I connect either with a person’s guide or their angel, and information will come through to me for them about their spiritual development and soul expression. While I don’t do traditional readings such as tarot, when I work with clients, information regarding past, present and future issues does surface for the client to work with. I call this a soul development reading. Such sessions can be done in person or over the phone. I no longer provide taped recordings for these sessions as I become too out of body to focus on the machines, but I encourage you to tape the session on your end, or to take notes by hand. Upon leaving the corporate world after a twenty five year career in marketing and sales, I earned a Bachelor’s of Divinity and am ordained through the Universal Brotherhood. I live in the Nashville, Tennessee area where I am a spiritual counselor, holistic healer and inspirational writer who especially enjoys writing spiritual articles and books for children of all ages who are young at heart. I provide spiritual counseling and holistic healing for others during periods of transition and growth, I also love to visit sacred sites and crop circles when ever I can. To schedule a session contact me and indicate the best time and manner for me to contact you.